Two days after the San Diego State football team crushed New Mexico, the Aztecs ended the season ranked in the Amway Coaches Poll. The poll, released Sunday, ranked the Aztecs No. 25. It’s the fifth time the Aztecs were ranked in the coaches poll this season after peaking in the poll at No. 18 on Oct. 8 when SDSU was 6-0. It dropped out of the rankings when SDSU lost to Boise State on Oct. 14. A loss to Fresno State followed, but the Aztecs ended the season at 10-2 by winning four straights. SDSU, however, remained unranked in the Associated Press Poll. The Aztecs received 46 votes, finishing in 27th place. San Diego State received 86 points in the coaches poll, 38 points behind No. 24 Mississippi State. The Aztecs replaced Boise State in the poll after the Broncos lost to Fresno State on Saturday. The Bulldogs will face the Broncos again next week in the Mountain West Championship in Boise. 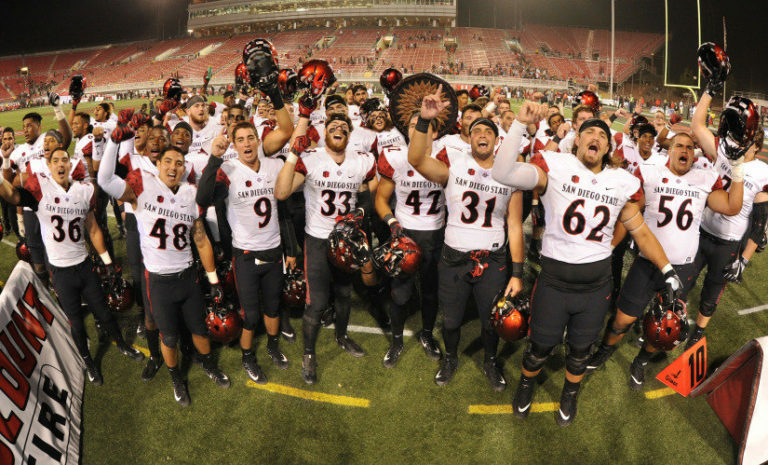 The Aztecs now await their official bowl bid, their eighth-straight — a school record. The official announcement will be made Dec. 3.